Why Choose Florida for Online Higher Education? College graduates in Florida can expect ample job opportunities in both the short-term and long-term. Strategy Labs projects that, by 2020, 65% of jobs in the state will require postsecondary education. In addition, according to College Measures some of the state’s fastest-growing industries, including educational services, nursing, and management, require a college education. This upward trend in employment for college-educated workers makes Florida a great place for in-state and out-of-state students to pursue an online degree. This guide covers the details of earning online degrees in Florida, including transfer credits, financial aid, and enrollment dates, and ranks the top affordable online schools in Florida. 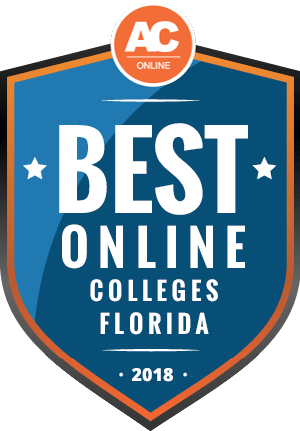 Let’s see which online colleges in Florida made the grade for 2018. One of the top schools in Florida, Saint Leo University was founded with strong Catholic values and is the oldest Catholic institution of higher learning in the state. While Saint Leo has one main campus, they've grown and expanded to more than 40 areas across Central Florida, making them one of the most ubiquitous universities in the area. Along with their campuses and locations, Central Florida is also recognized as one of the top online schools in Florida. In fact, more programs are offered through their online school than on-campus, making online learning ideal. Their online school is designed to help those who have busy schedules and cannot meet strict schedules or those who live out of the area but still want a Saint Leo education. The University of Florida has been around for over 160 years, making it one of the oldest and most well recognized institutions in Florida. Most recognized across the country for athletics, the University of Florida also emphasizes the importance of a good education. One goal of the university is to give back to the community, and is consistently ranked among the nation's top universities. For students who live outside of Florida or who want to study without commuting to a campus, there are plenty of online learning options. Degree options range from undergraduate to doctoral, along with the options to study internationally. Because of the school's reputation and their massive online program, University of Florida is considered one of the top online schools in Florida. The University of South Florida is one of the larger four-year public institutions in the state. With a student to faculty ratio of 21:1, students will find that they receive plenty of individual help from educators. USF is also one of the top schools in the nation in terms of research, and they funnel plenty of money into research projects, allowing students to get more out of their education. USF is also home to some of the top ranking online degrees in Florida. Most of the online degrees offered are at the master's level, giving students the chance to continue working while pursuing an advanced degree to further their career. Many students don't just want an education when they attend college, they also want a hands-on experience so they have a better knowledge of their field when they graduate and start working. The University of Central Florida understands this, and to prove it they commit to many research projects, some of which get national attention. UCF is also considered one of the most innovative schools in the country, largely due to their research efforts. But they have also innovated with their online program, and they are considered one of the top online schools in Florida for earning a bachelor's degree. With dozens of degrees offered entirely online, students can easily earn the same UCF education while pursuing their degree online. The main goal at the University of West Florida is to make the school a great place to learn and work. They achieve this through their strong academics, and many students who attend UWF end up becoming an important part of the local and greater Florida community. In fact, UWF is a large economic supporter of the state. UWF is also considered one of the top online schools in Florida for military members, but quality education extends well beyond military members as their online school has over 600 courses available to students. Their online RN-BSN degree is also considered one of the top in the nation. Since its inception in 1968, Warner University has provided higher education to students who want to learn in an environment based on five core Christian values: knowledge, wisdom, growth, integrity, and service. For those interested in getting this type of religious-based liberal arts education from online colleges in Florida, the school offers distance associate and bachelor's degree programs. On the bachelor's level, Warner has degree programs in business administration and education studies that are designed for nontraditional students over 23 years old who want to learn the fundamentals to prepare for a career, while getting the discernment to make professional decisions from a Christian perspective. In addition, the school has a distance associate degree program in general studies for students who want to lay the groundwork for a higher level degree program, as well as online associate and bachelor's degrees in Christian ministry for those who want to work for churches, community-based ministries, and non-profit missions. Keiser University's Online Division, which is run through the school's main campus in Fort Lauderdale, offers dozens of diverse online degree programs on the graduate and undergraduate levels. From paralegal studies to homeland security to health science to information technology management, Keiser has programs that provide education to online students that is comparable to what traditional students enjoy. In addition, Spanish-speaking students who want to earn online degrees in Florida can enroll in programs taught completely in Spanish-such as associate degrees in general studies, medical assisting science, and medical administrative billing and coding, and bachelor's degrees in accounting, business administration, and interdisciplinary studies. No matter what program students enroll in, they have access to several Keiser University student services, such as help with resume writing, access to job postings, and coaching to sharpen interview skills. Also, online students can participate in student organizations to give them the well-rounded experience their on-campus counterparts receive. Students who want to attend online schools in Florida can find a variety of programs at Southeastern University. The school offers graduate and undergraduate programs in areas such as business, behavioral and social sciences, criminal justice, design and communication, education, and ministry. For example, the bachelor's degree program in digital media and design, which is the only fully online degree of its kind offered by a private Christian university in the state, prepares students to work in communication, marketing, and web and digital design jobs. Those who are interested in providing counseling from a faith-based perspective can earn an online bachelor's or master's degree in human services, psychology, or international community development-all of which are designed to teach students to serve the community the way Jesus did. Similarly, those who want to serve their community through education can get the expertise they need by enrolling in Southeastern University graduate degree programs in reading education, educational leadership, exceptional student education, and teaching English to speakers of other languages. Florida Agricultural and Mechanical University programs get high marks. In fact, the school made the list of Top 10 Best Historically Black Colleges or Universities and Best National Universities compiled by U.S. News and World Report in 2014 and was named one of the top colleges in the country by Forbes and one of the best Southeast colleges by The Princeton Review. With online degrees offered through its School of Business and Industry, School of Nursing, and Institute of Public Health, prospective students who want to earn online degrees in Florida have an e-learning environment that encourages communication with professors through email, phone, or chat sessions. Technologies like Blackboard, videoconferencing, and streaming video provide an interactive classroom experience and access to learning materials through each academic department. In addition, Florida Agricultural and Mechanical University provides technology help desks that assist students with the different online platforms they are required to use. Although online students who attend Florida International University may not be on campus in Florida with their classmates, they are given all the tools they need to be successful in a distance learning environment. From access to a Learning Management System to convenient OneStop Enrollment Services and an Online Tutoring program, students who enroll in online degree programs at FIU get support at the click of a mouse. Armed with these resources, students can earn undergraduate degrees online in areas such as communication arts, human resource management, and criminal justice, as well as graduate degrees in special education, music education, and public health. In addition, Florida International University offers undergraduate- and graduate-level professional certificates in disciplines like conflict resolution and consensus building, health and fitness marketing, pediatric nutrition, labor studies, women's and gender studies, and nursing education. Also, the school offers continuing education classes and massive open online courses. Students who want to earn a degree from online schools in Florida can get a high-quality education when they enroll in a program at the University of South Florida St. Petersburg. The school's online degree programs have received Quality Matters recognition which requires a rigorous evaluation of courses' accessibility, usability, activities, learning objectives, and student engagement. One example of the school's Quality Matters endorsed programs is the fully online digital journalism and design master's degree program, which teaches Internet-related topics such as social media, multimedia production, web design and publishing, and information graphics. Also, the school's educational leadership graduate program is for current educators who want to advance in their careers, and the MBA program allows students to focus their studies on areas such as marketing strategy, forensic accounting, business analytics, corporate social responsibility, and international business. Embry Riddle Aeronautical University is no stranger to providing distance education: In fact, the school began offering distance learning back in 1971, making it one of the first colleges in the country to provide programs to students that weren't based on campus. Today, students who want to enroll in online colleges in Florida can take courses during the school's 12 undergraduate terms and 10 graduate terms that last nine to 12 weeks. For example, on the undergraduate level, the school offers associate degrees in aviation business administration, logistics and supply chain management, and technical management and bachelor's degrees in aeronautics, communication, and aviation business administration. On the graduate level, students can enroll in master's degree programs in areas such as entrepreneurship in technology, human factors, project management, and occupational safety management. Also, Embry Riddle Aeronautical University offers massive open online courses for free to students who want to increase their knowledge of aviation without enrolling in a degree program. The University of North Florida offers distance learning programs that are built on student engagement and interaction, meaning those who want to earn online degrees in Florida can get the same attention as students who are enrolled in traditional programs. Named for having among the best online programs by U.S. News and World Report, UNF offers online graduate degrees through its Brooks College of Health, College of Education and Human Services, and College of Arts and Sciences. For example, on the master's level, students can enroll in programs that cover areas such as criminal justice, nutrition and dietetics, educational leadership, and American Sign Language/English interpreting. Those who want to earn a doctoral degree can study clinical nutrition and nursing practice in psych-mental health. In addition, the University of North Florida offers graduate certificates for those who want to sharpen specific skills to advance in their careers. Prospective students who want to earn online degrees in Florida for business disciplines can enroll in distance programs at Webber International University, which offers programs on the undergraduate and graduate level. For example, the school offers associate degree programs in accounting, finance, and criminal justice management, as well as bachelor's programs in computer information systems, hospitality and tourism management, and integrated marketing communications. Students who want to earn an advanced business degree can choose a variety of MBA programs online at Webber International University, such as degrees that focus on international business, sports business, criminal justice management, and accounting, as well as a standard MBA for those who want an overview of different principles of the field. Those who enroll in these programs can receive support from the school to help them succeed, including an online orientation that familiarizes them with Moodle, the school's e-Learning system. Also, online students have access to technical support if they need extra help navigating the system. At Florida State University, students may enroll in undergraduate and graduate programs that can be completed entirely online, including bachelor's degrees in computer science, criminology, and crime scene investigation; and master's degrees in information technology, communication disorders, and art education. The school also offers an online doctoral degree in educational leadership and policy for students who want to take supervisory roles in the field or become a college professor. In addition, the school offers a variety of graduate and undergraduate certificate programs for students who want to get specific career skills from online schools in Florida without enrolling in an entire degree program. Some of these certificates can be earned in areas such as leadership studies, U.S. intelligence studies, multicultural marketing, emergency management and homeland security, information leadership and management, human performance technology, and health information technology. Also, there are several online elective courses that can be taken by students in traditional programs offered by Florida State University. Back in 1943, The Baptist College of Florida began offering classes in the Sunday school room of the First Baptist Church of Lakeland in order to provide a prerequisite college degree to those who wanted to enter seminary training. Since its humble beginnings, the school has been dedicated to providing educational opportunities that are based on a Christian worldview, including online versions of all its degree programs and courses that are available through a learning management system called MyBCF. Students interested in online colleges in Florida who want to learn coursework from a Baptist perspective can enroll in degree programs including associates degree in music, Christian education, and general studies, and bachelor's degrees in psychology, worship leadership, elementary education, English secondary education, and English. Also, The Baptist College of Florida has master's programs in Christian studies and music and worship leadership. In most cases, the online programs the school offers are asynchronous, which allows students to complete their classwork at times that are convenient for their schedules. Florida Atlantic University provides online graduate and undergraduate degrees, as well as online minors, through its Center for eLearning. The school is a pioneer of distance learning among online colleges in Florida, as it began offering distance education via video-taping technology fifty years ago. Today, students who enroll in distance programs can stream live and recorded lectures, as well as use interactive Internet tools, in order to participate in their courses. FAU offers several options from their difference schools-such as the College of Science, the College of Engineering and Computer Science, the College of Business, and the College of Arts and Letters-including undergraduate degrees in interdisciplinary studies, business administration in marketing, geography, and computer science. In addition, graduate students can enroll in master's degree programs in electrical engineering, adult and community education leadership, computer engineering, and nursing administrative and financial leadership. Students can also minor in areas such as criminal justice, hospitality management, and geographic information science. In order to give people the training they need to enter the ministry and work for Christian missions, Trinity Baptist Church created Trinity Baptist College in 1974. To help facilitate this process for students who want to attend online schools in Florida, Trinity Baptist College offers online classes through its TBC Online and Evening Division. Although the school does not offer completely online degree programs, there are several classes that students can take online toward their degrees, such as entrepreneurship, history of civilization, history of math, speech, English composition, organizational ethics, and general psychology. In addition, students can take courses online related to religious topics like the New Testament, biblical leadership, pastoral epistles, and personal evangelism. Adults who are looking for online colleges in Florida so they can go back to school and earn a bachelor's degree can enroll in the TrinityQuest program at Trinity College of Florida. This accelerated program allows students to conveniently complete their degrees online in two years or less, as they juggle the other responsibilities in their lives. To provide as much flexibility as possible, Trinity College of Florida offers courses that are five weeks long and available throughout the year. Also, the school offers hybrid degree programs that allow students to complete some of their coursework online, while taking some classes on campus. Some of the hybrid degree programs available are in areas such as advanced theological studies, elementary education, psychology, interdisciplinary studies, and business organizational leadership. There are also certificate programs in biblical studies, apologetics and Christian evidences, and worship studies available in a hybrid format. St. Petersburg College is a great choice for students looking for career-focused education at online schools in Florida. St. Petersburg offers completely online degree programs as well as hybrid programs for those who want to spend part of their time on campus. The school offers dozens of online degrees, in in veterinary technology, early childhood education, digital forensics and computer investigations, and web development. Professional certificates are also an option in areas such as funeral arts advanced technology, crime scene technology, healthcare informatics, and computer support. and bachelor's degrees in educational studies and community leadership, public safety administration, dental hygiene, and business administration. The Fuse Program makes it possible for students to save money by starting their education at St. Petersburg and finishing a bachelor's degree at USF Tampa/St. Petersburg. The State College of Florida Manatee Sarasota offers distance learning for those who want to attend online schools in Florida. SCF Online allows students to take courses that are completely offered online or classes that have a combination of online and on-campus work. As a result, students get the best of both worlds-the convenience of doing work online as they juggle personal and professional responsibilities and the face-to-face interaction that helps connect students with their peers and professors. When students take courses through SCF Online, they get the same course content as their on-campus counterparts and have access to tools, such as tutorial services and computer labs. Online courses offered by State College of Florida Manatee Sarasota are delivered through the Canvas learning management system and the school provides technical support 24 hours a day. FSCJ Online, which is operated by the Florida State College at Jacksonville, offers several education options for students who want to earn online degrees in Florida. On the associate degree level, students can enroll in two-year programs for computer information technology, office administration, supply chain management, and industrial management technology. In addition, the school offers bachelor's degrees in nursing, human services, early childhood education, and business administration. Also, there are certificate programs available for those who want to gain specific career skills without enrolling in a complete two or four-year degree program. Depending on the program, students can finish a certificate within four to twelve months. Areas of study for these programs include logistics and transportation, criminal justice technology, office management, and business operations. Delivered through the Canvas Learning Management System, the Florida Gulf Coast University offers online degrees in Florida to students who want the convenience that distance learning affords. This continues the school's tradition of providing distance education: In 1998, Florida Gulf Coast University embarked on a plan to offer convenient education opportunities to those inside and outside of the Southwest Florida region. Today, students who want to earn advanced degrees at the school have options such as master's degrees in health science, curriculum and instruction - educational technology, special education, public administration, and business administration that can be entirely completed online. Those who are undergraduates can also complete degrees in criminal justice, legal studies, and health science online, while students who want to sharpen specific professional skills can earn certificate programs in local government management, health services administration, and planning. When students enroll in online colleges in Florida, they need to be confident that their education experience will be comparable to what the students on campus receive. Florida SouthWestern State College provides this by giving online students a variety of resources to help them succeed in their degree programs, such as tutoring services, an IT HelpDesk, writing resources, and mental health counseling. Equipped with these resources, students can earn degrees online through the School of Business and Technology, the School of Health Professions, and the School of Education, including associate degrees in business administration and management, accounting technology, early childhood education, and social and human services or bachelor's degrees in cardiopulmonary sciences, supervision and management, public safety administration, and nursing. Hobe Sound Bible College provides education based on the Wesleyan tradition, so students who want to earn online degrees in Florida can take coursework that is Christ-centered and based on biblical principles. In order to help students get the education they need to prepare for a career, or to be effective in ministry, the school offers online associate and bachelor's degree programs. On the associate level, students can earn degrees in biblical studies, counseling or intercultural studies, while bachelor's-level students can earn degrees in elementary education, counseling, ministerial studies, or secondary education. In addition to providing education to adults, the school also has dual enrollment programs for high school students that allow them to complete both their high school and undergraduate degrees simultaneously. Daytona State College offers a range of undergraduate academics through its online degree and certificate programs. Students can choose between 12 different associate and bachelor's degrees combined at the college in technology, arts, business and office administration. The fact that the school offers academic pathways to an accredited postsecondary education that take under a year to complete via its Center for Business and Industry is key to Daytona State College being a best online college in Florida. Accounting, finance, technology, design and composition are types of instructor led non-credit courses at the center. Exam based assessment services allow students taking online and on campus classes the chance to earn college credits for prior learning. E-books, print books, articles and videos are accessible 24 hours a day at the Computing Commons. Indian River State College is among the country's most affordable colleges. More than 100-degree, certificate and diploma programs are available to students. A key emphasis of these applied science, arts, education, health sciences and technology programs is to advance local and national career, cultural, professional and economic development. A virtual staff educates and supports students pursuing online associate and online bachelor's degrees. These services help Indian River State College to meet the criteria of a best online college in Florida. Except for times when they need to take an exam assessment or a proctored exam, students taking online classes generally will not have to travel to campus. There is no cost associated with the assessments. Adult learners can expect to log into Blackboard and the online student portal as they advance through course material. Broward College provides two roads to an accredited undergraduate degree. Students can enroll in an online or campus program. The second pathway to earning an associate or bachelor's degree at this best online college in Florida is through the school's transfer program. Broward College participates in Florida's statewide articulation agreement program, a program that allows students to transfer up to 60 semester hours into a bachelor's degree program at another accredited Florida college or university. Online learning webinars, technical certificates, associate degrees in business administration, computer systems and criminal justice and bachelor's degrees in nursing, management and technology are part of the virtual campus. Deadlines to submit assignments and take exams apply when taking online classes. Established in 1990, Hodges University is a private school offering online and flexible campus programs in accounting, life sciences, law, business, nursing, technology, health services, public administration and communication. Campus classes are available at the school's Naples and Fort Myers locations. The university confers 10 associate degrees, over 12 bachelor's degrees and 10 master's degrees. All degree levels are available through the school's online platform. Instructor and peer interactions are encouraged while taking online courses. These interactions come through emails, instant messaging, conference connections and Blackboard. Fisher School of Technology and Johnson School of Business are two of the five distinct schools at Hodges University. Experiential learning and internships are part of this best online college in Florida. Everglades University's main campus is located in Boca Raton. The school's extended campuses are located in Sarasota, Tampa and Orlando, home to Disney World and Universal Studios. Initially known as American Flyers College when it first opened its doors in 1998, Everglades University offers more than 10 undergraduate programs and four graduate programs. A broad distance learning course catalog is why the school is a best online college in Florida. Courses in the catalog that lead to an undergraduate or graduate degree are offered both online and on campus. Possible degrees include alternative medicine, aviation, construction management, business administration and public health administration. The school's online division operates with academic tutoring, an online library, databases and recorded videos. The University of Fort Lauderdale is a Christian university made up of three academic schools. More than 12 degree options are conferred through the College of Liberal Studies, College of Religious Studies and College of Business Leadership. At the top level, this best online college in Florida awards a doctorate degree in ministry. Online education is administered through the Populi system. The University of Fort Lauderdale leverages online classes to deliver 16-week semester based academic programs to students who need added flexibility to finish their degrees. Other learning models at the school include extended learning, self-study and classroom. At the foundational level, programs include Biblical studies, theory, biblical doctrine and ministry. The University of Florida-online is a regionally accredited best online college in Florida. Up to 19 majors focus on areas such as anthropology, biology, computer science, environmental management, psychology, sport management and public relations. Students can augment their major with a choice of one of seven different minors including accounting, anthropology, business administration, geography, health promotion, mass communication, sociology. Students can hit the ground running with UF Online OneStop. Students only need Wi-Fi since the University of Florida-online delivers online resources through GatorLink, One.UF, webmail and MyUFL. Whether students attend classes at the school's Gainesville, Florida campus or online, they are encouraged to graduate with a bachelor's degree within eight semesters. Instructors at Adventist University of Health Sciences, a best online college in Florida, teach online and at the school's Denver campus. Clinical experience comes through Florida Hospital, a healthcare facility that the Seventh-Day Adventist Church operates. This is the one time when students must travel away from home to finish degree requirements. Online certificate and bachelor's and master's degree programs are taught fully online. Class sizes are kept low, averaging about 20 students per instructor. Canvas is the school's online content management system. After logging into Canvas, students review class assignments, take exams and connect with professors and peers. Both campus and online students at Adventist University of Health Sciences have access to the school chaplain. South Florida Bible College and Theological Seminary is based in Florida's Broward County. 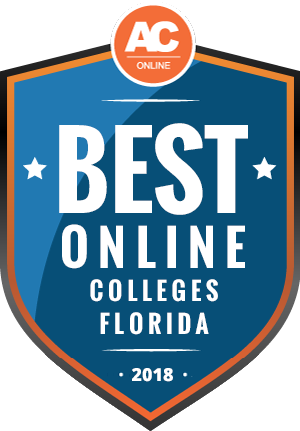 As a best online college in Florida, the college's master's degrees have an option to be completed fully online. Undergraduate degrees are taught nearly half online. The fully accredited Christian school uses online orientation, online counseling and online advising to ease students into virtual courses. Academics at South Florida Bible College and Theological Seminary are in biblical studies, divinity, Christian business management, Christian counseling, pastoral ministry and religious education. Christian field experiences are available during fall, spring and summer semesters. At least 100 hours of field experiences are necessary to graduate. Remington College-Heathrow Campus is one of the best online college in Florida school's 15 campuses. The Heathrow campus is located 19 miles north of Orlando. In addition to healthcare, the college provides academic training in technology, business, criminal justice, creative arts and health and beauty. Continuing education and fast track graduation options are available through Remington College-Heathrow Campus online division. Shorter time to graduate is achieved through the fast track program as students take two online classes simultaneously. While enrolled in online programs, it's possible to earn a master's degree in health information management. Students can earn online bachelor's degrees in criminal justice, organizational management and health information management as well as three associate degrees and a medical office administration diploma. Polytechnic University of Puerto Rico-Miami is located in Miami. Students receive training in English and Spanish. Even during the catalog search and online application processes translation services are available. Students can pursue degrees in the fields of business, architecture, engineering, education and finance. MyPoly and Blackboard Learn house online course assignments, exams and student progress reports. Besides virtual degree classes, Polytechnic University of Puerto Rico-Miami offers eight continuing education classes. Continuing education classes at this best online college in Florida are in language, occupational safety, project management, lean six sigma, technology, quality management and construction. Students taking online classes can also expand their experience with job fairs and internships. Florida Institute of Technology is headquartered in sunny Melbourne. Research, festivals, concerts and lectures focused on local natural restoration areas are regularly offered at the school. Access is a single portal that connects adult learners to a range of Florida Institute of Technology-Online courses. Dozens of online classes are taught at the best online college in Florida. Instructors teach accounting, applied psychology, business administration and criminal justice classes at undergraduate and graduate levels. Once logged into Access, students send and receive campus email and gain access to recording videos, school manuals and other academic portals like PAWS and LMS. Online learners can expect to use Canvas, OrgSync and Access Florida Tech as they progress toward a degree. Florida colleges offer more than 200 fully online programs, which enroll about 160,000 students. The many online programs in Florida provide academic opportunities to underserved populations who have not enjoyed widespread access to education. Through online education, single parents and full-time professionals can earn a degree while fulfilling their responsibilities. Overall, tuition tends to be more affordable for in-state students than for out-of-state students. However, many schools set different rates for online and on-campus students, and some institutions extend in-state rates to online learners, regardless of location. In addition, students in some neighboring states may qualify for reduced tuition rates through reciprocity agreements. Private colleges and universities charge the same rates to residents and nonresidents. To qualify for in-state tuition, students must have lived in Florida for at least 12 months prior to the start of classes. According to the government data below, nonresidents pay more than triple the in-state tuition rate at public institutions. Both in-state and out-of-state students in Florida pay significantly less than the national average tuition for two-year and four-year public institutions. Tuition costs vary by school and program. Even online programs within the same university may cost different amounts. Typically, public two-year colleges charge the least, followed by public four-year universities and then private institutions. Depending on your academic interests and preferences, attending an out-of-state college may be an ideal option. However, out-of-state students should consider a few factors before choosing an online program in Florida. Some interstate agreements can significantly reduce tuition costs for students in nearby states. In addition, you should research state restrictions that would prohibit you from attending online universities in Florida. Four regional interstate compacts in the U.S. help institutions collaborate and promote high-quality education across state lines. Florida is a member of the Southern Regional Education Board (SREB), which also includes Alabama, Arkansas, Delaware, Georgia, Kentucky, Louisiana, Maryland, Mississippi, North Carolina, Oklahoma, South Carolina, Tennessee, Texas, Virginia, and West Virginia. SREB’s Academic Common Market allows students in member states to pay in-state tuition rates at colleges in 15 participating states (all members except North Carolina). Students who want to pursue degrees that are not available at institutions in their state qualify for this program. Florida joined the State Authorization Reciprocity Agreement (SARA) in 2017. All participating SARA states follow the same national standards for regulating and approving distance education programs, making it easier for online colleges to enroll out-of-state learners. To receive SARA approval, Florida institutions undergo a voluntary application process. Nonresidents considering earning an online degree in Florida can choose from nearly 80 SARA-approved online colleges and universities. This section answers some of the most common questions about online learning in Florida. The resources below can help students find an online program that fits their goals and lifestyle. Do online credits cost more or less in Florida? Online tuition structures vary widely between schools in Florida. Some institutions charge all undergraduates the same rate, while others charge different rates to online and on-campus learners. Additionally, many colleges in Florida charge the same tuition rate to all online students, regardless of residency. Some schools charge distance learners per credit, while others charge a flat rate each semester. Students should research online colleges in Florida to determine which best match their budget and learning preferences. Students mainly considering public institutions can consult the State University System of Florida’s list of public four-year universities. In addition, the Florida Department of Education maintains a list of institutions in the Florida College System. Which Florida schools accept the most transfer credits? Each school in Florida sets its own transfer policies, and some colleges accept more transfer credits than others. The University of Florida accepts transfer credits from courses where students earned at least a D and requires students to complete at least 25% of their credits through the university. At the University of Miami, transfer students from two-year colleges must complete 56 credits in residence, while those from four-year institutions must earn 45 credits at the school. Transfer policies vary widely, and some programs do not accept any transfer credits. Transfer students should carefully research the policies of each prospective school. Statewide articulation agreements allow students to easily transfer from associate programs at state colleges to bachelor’s programs at public four-year universities. Students who graduate with an associate of arts degree from a college within the Florida College System are guaranteed admission to one of 11 state universities. However, students are not guaranteed entry to any program, since some bachelor’s programs include additional requirements, such as a certain GPA, minimum test scores, or prerequisite coursework. Students can learn more about transfer policies through FloridaShines, a service from the Florida College System and the State University System of Florida. Will any online colleges in Florida accept a GED? Most institutions accept a GED in place of a high school diploma. Colleges evaluate applicants on several criteria in addition to a high school diploma or GED. Many schools require ACT or SAT scores, high school transcripts, letters of recommendation, and personal essays. These components provide plenty of opportunities for applicants to impress admissions officers. Plus, GED holders can improve their chances of acceptance by earning a high score on the GED exam. The Florida College System provides links to information about admission requirements at Florida’s state colleges. The State University System of Florida offers resources about the admission processes at Florida’s public four-year universities. In addition, the Florida Department of Education posts information about obtaining and using a GED in the state. How many academic terms per year do online colleges in Florida offer? Online programs generally afford students more flexibility than on-campus programs. Distance learners can study from anywhere with an internet connection, and they can schedule their studies around other obligations. In addition, online learners may not need to wait until fall to begin their studies. Though programs typically do not start every week or month, many colleges offer online students multiple start dates each year. The number of start dates available often depends on the program’s delivery format. Cohort-based programs, in which a group of students begin and finish the degree at the same time, typically include more rigid start dates than self-paced programs, which allow students to progress through courses independently. Prospective students should research online colleges to determine which programs best fit their schedule. The Florida College System provides links to information about online learning at Florida state colleges, including start dates and delivery formats at public two- and four-year institutions. Students can use the FloridaShines online course search to learn when courses start and end at various schools. Which online colleges will accept FAFSA in Florida? To qualify for U.S. government aid, students must attend an accredited college or university. The Florida Department of Education provides accreditation information for students considering online colleges in Florida. The state’s Office of Student Financial Assistance maintains a list of state-sponsored scholarships and grants. The Florida Department of Education also provides links to resources related to financial aid. Are there any free online classes I can take from Florida colleges? Many colleges offer free online courses to the public. These classes, often called massive open online courses (MOOCs), are a great starting point for learners considering an online degree. Though free courses do not award college credit, they can help students decide whether online education is right for them. Colleges often deliver free courses in a similar format as paid, for-credit classes. Free online classes can also help students explore a variety of subjects and disciplines. Florida International University offers nine MOOCs, which are self-paced and condensed versions of college-level courses. These eight-hour classes cover topics such as cybersecurity, entrepreneurship, and project management. The University of Florida offers free online courses, which mainly comprise video lectures. Subjects include financial planning, agricultural land management, and the science of athletic training. In addition, Barry University offers an MOOC in mathematics that prepares students for college-level math courses. FloridaShines provides free educational resources through the Orange Grove, where students can access free textbooks, courses, and materials including learning modules and videos. How can I find the online program options at Florida colleges? Students can visit each prospective school’s website and peruse online program options. Schools often mention whether a program can be completed online, on-campus, or in a hybrid format; however, not every school prominently displays this information, and reading through dozens of college’s websites can be a hassle. Fortunately, students can use a few tools to quickly and easily search through online programs in the state. The Florida College System provides links to online learning pages at two-year and four-year state colleges. In addition, FloridaShines offers a degree search tool that allows users to search for programs by subject, location, and delivery method. Pell Grants and other federal financial aid programs are ideal for students who need to reduce out-of-pocket tuition costs. Not everyone qualifies for federal aid; however, and Pell Grants only cover first-time undergraduate students. Below are a few scholarships opportunities for Florida students, which can supplement or replace federal aid. This state-sponsored scholarship supports Hispanic students who plan to attend public or private institutions in Florida full time. Applicants must have a 3.0 high school GPA and must demonstrate at least $2,000 in financial need through the FAFSA. Only Florida residents qualify for this scholarship. High school seniors living in several Florida counties, including Palm Beach County, can apply for this scholarship. Applicants must be active in their community and school and must demonstrate strong academic and career goals. Applicants must also show financial need. Recipients may attend any accredited institution and study any discipline. The Godbold Foundation sponsors this scholarship for high school seniors living in the Tampa Bay area, including Hillsborough, Pasco, and Pinellas counties. Applicants must have overcome significant obstacles, must demonstrate financial need, and must hold at least a 3.0 GPA. Recipients must attend a public university in Florida. This scholarship from the Florida Reading Association supports educators in the state who are working toward a graduate degree. Applicants must be enrolled at or plan to attend a university in Florida and must choose a degree related to reading education. Applicants should have at least three years of classroom teaching experience. The Florida Office of Student Financial Assistance offers this scholarship to high-achieving students who demonstrate financial need. Applicants must reside in Florida and enroll full time at Bethune-Cookman University, Edward Waters College, Florida A&M University, or Florida Memorial University. Applicants must have at least a 3.0 high school GPA.